Moose tackles the Hunt Trail. It was the stormiest day of the week - winds, rain, and freezing temps - the final day of our Appalachian Trail through hike and the exact six-month anniversary of the day we started the trail. We had no choice but to give it a go. Two hours into our climb up the Hunt Trail and we had reached tree line, the winds were ferocious, nearly knocking Moose off her feet so we paused and retreated to collect ourselves. Soaking wet from the constant freezing rain, we found refuge in a rock overhang. We changed into our backup dry clothes and ate our meager rations to stay warm while we waited for the storm to let up. After a chilling half hour of waiting, our dreams of summiting were looking grim, we were both on the verge of hypothermia, shivering uncontrollably. Then out of nowhere, three men appeared from below, through hikers like us. They were the first people we had seen in two days (outside of a Baxter State Park ranger). We discussed the conditions above and and the difficulty we would face. It was a journey the two of us could not safely attempt alone but with the backup of our fellow comrades, we decided it was doable. We slowly tackled the massive icy boulder field up the mountain and made it to the top. Visibility with the whipping wind and eventual hail was no more than 20 yards and while we completed our goal, we never set eyes on the glorious views Mt. Katahdin offers. We always knew we would return in good weather to catch a glimpse. Elevation profile of the final 30 miles of the Appalachian Trail, Mt. Katahdin on the right. Baxter State Park requires all visitors have a permit to enter the park as it only allows so many vehicles in per day. We were able to reserve a vehicle permit, but we were unable to snag an in-park camp site due to the high demand of the Columbus Day holiday weekend. This caused no concern as we were able to get a spot at the New England Outdoor Center just a few miles down the road from the park gates. Although we are not huge fans of paying for camping, the sites were great (besides being quite close in proximity to each other) and only cost $14 per person. We had a great location right next to Pockwockamus Pond which offered great views of Katahdin as seen above. Once we were all set up, Fin and Teton launched the kayaks for an evening paddle on the quiet pond in search of moose. While their search proved to be futile, the evening fall scenery was well worth their efforts. Fin paddles the serine water in search of moose. The next morning we woke up at 4AM in order to devour a delicious breakfast cooked up by Alpine; eggs, potatoes with onions and peppers and a ton of bacon. We all downed a pot of fresh pressed coffee and headed to the entrance of Baxter. The gates open up at 6AM and you must arrive by 7:05AM to fulfill your vehicle reservations or they will offer your spot to other arrivals. Bacon, the most important meal. Once in the park, we drove north on Roaring Brook Road to the Roaring Brook Campground and parking area where we signed in and hit the trailhead. 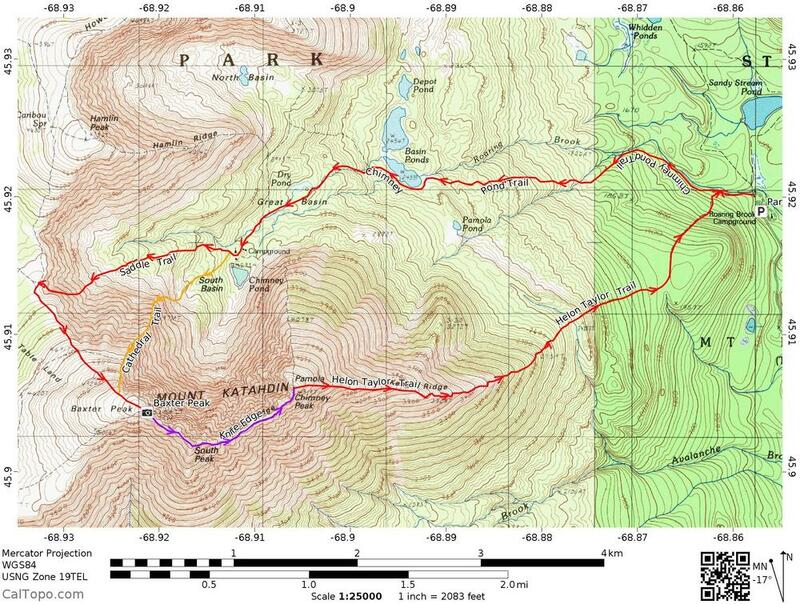 Our plan was to to take the 3.3 mile Chimney Pond Trail to the Chimney Pond Campground and ranger station, once there we would take the 1.4 mile Cathedral Trail up the mountain and connect up with the Saddle Trail for a .2 mile haul to Baxter Peak, the highest point in Maine. Teton gazes upon the South Basin of the mountain. Fin, Teton, and Alpine pose for a shot at the shore of Chimney Pond. The weather, per usual, was not as agreeable as the weatherman had predicted. In fact, it was far worse. The ranger at the trailhead sternly advised us of the danger we might encounter if we followed through with our plan of a Cathedral Trail ascent. Being the steepest and most technically challenging trail in the basin, the Cathedral is practically a one-way path that is nearly impossible to descend once within its vertical grasp. With close-to-freezing temps, extremely high winds, and decent ice build up, the group decided it was best to pass and take the much more gradual Saddle Trail. The Saddle Trail was certainly not effortless, but it was far easier and much quicker than the physically demanding Hunt Trail (AT) which we had traversed a year before. As we gained elevation, we eventually entered the storm clouds that had swallowed the upper regions of the mountain and the weather worsened. Once we topped the Saddle Slide and entered the ridge line portion of the Saddle Trail we felt the full force of the wind. Teton whipped out his Davis Wind Wizard™ and measured a steady 45 mph wind speed. We consumed some calories and layered up before starting the short .8 mile ridge line scoot to Baxter Peak. Once again foiled by the weather, we were unable to catch a glimpse of Katahdin's epic views, but we were happy to visit our old friend atop Baxter Peak. We posed for a couple shots atop the famous sign and then took shelter among the rocks to quickly eat our lunch. Our plan post-summit was to tackle the infamous Knife Edge a 1.1 mile traverse of the most harrowing ridge line east of the Rockies. With close to 1,000 ft. drops on either side and a width of only 3 ft. at its narrowest, the Knife Edge traverse was at the top of the ranger's do-not-attempt list. While it is recommended to take heed to the ranger's warnings, they are not their to tell you what you can and cannot do, it is purely hiker discretion and we were there to tackle the Edge! We took a quick group vote and we decided to push onward across the Knife. Music accompaniment chosen by Alpine. To capture the last three shots, Teton developed and built an 8 ft. collapsible GoPro™ boom to capture the Knife Edge with a drone-like angle, but due to the bad weather and temperamental high winds he was only able to put it to use once and for a very brief period. Once we began the traverse there was no going back; the crowds that we had encountered at the Chimney Pond Campground had shrunk to a large party that made the climb up the Saddle Trail, from there even more were whittled out and only a small grouping existed at the summit of Baxter Peak, and now on the Knife Edge, the crowd in its entirety had diminished. It seemed as though everyone had turned back and we had stepped onto another planet altogether. With icy sleet thrown our way by steady 45mph winds and gust surpassing 60mph we trudged onward slowly and steadily. The winds a top the Knife Edge frequently maxed out the Wind Wizard's™ top reading of 60mph. After a couple hours of hand mangling granite navigation, we reached the terminus of the Knife Edge, Pamola Peak. Like a scene from a movie, the clouds split and began to clear for us and we finally caught a glimpse of the glorious fall forest colors below. In celebration of their efforts and accomplishment, Teton passed out his in-case-of emergency whiskey (used as a last resort ailment for its warming affects in freezing conditions) and we cheered to an unforgettable and truly epic first-time traverse of the Knife Edge. We then began our descent off the mountain via the far less demanding 3.2 mile Helon Taylor Trail back to the Roaring Brook Campground. Alpine, the Helon Taylor Trail and the beautiful Maine fall foliage. The adventure gang poses for a picture at the Roaring Brook ranger station after a successful traverse of Mt. Katahdin and the Knife Edge (Top) Fin, (Bottom) Moose, Twirls, Teton, and Alpine.